Track, identify, & engage high value opportunities like never before with Thomas WebTrax® 3.0. NEW YORK--(BUSINESS WIRE)--Thomas, the leader in product sourcing, supplier selection and marketing solutions for industry, has announced the release of Thomas WebTrax® 3.0, a free platform that enables suppliers to track, identify and engage buyers that are in-market for the products or services they offer. The platform delivers actionable, real-time “Opportunity Intelligence” that allows users to go beyond simple web analytics to engage real buyers. Thomas WebTrax collects and stores real-time activity data from the supplier’s website, Thomasnet.com® profile, eCatalogs, CAD files, and even phone calls, and presents it on a single dashboard. This gives suppliers a complete history of each buyer’s engagement with the company’s digital marketing presence, and provides insight into what the buyer is interested in and how far along they are in their buying journey. Suppliers’ marketing teams can identify their high-value opportunities by filtering for parameters such as industry, geography, company size, and revenue. When sales teams receive these high-value opportunities, the insight they have into the buyer’s interests -- and their progression within the buying journey -- enables sales to craft more relevant and useful outreach calls, with information the buyer wants and needs at the various stages of that journey. In addition to a free Basic Profile on the Thomasnet.com product sourcing and supplier selection platform, Thomas WebTrax is free for qualifying businesses; visit http://Thomasnet.com/WebTrax to learn more. Thomas provides actionable information, data, analysis and tools that align with and support today’s industrial buying process. Its solutions include the Thomas Network at Thomasnet.com®, industry’s largest and most active buyer/supplier network. Through Thomas Marketing Services, the company provides full-service industrial marketing programs and website development. Thomas Product Data Solutions helps manufacturers connect with design engineers through advanced CAD/BIM and data syndication services. Thomas WebTrax® provides opportunity intelligence on in-market buyers to help marketing and sales teams track, identify, and engage high value prospects. Thomas Insights delivers original content to help marketers and supply chain professionals inform their decision-making, through leading titles including Inbound Logistics®, Industrial Equipment News® (IEN®), Thomas Industry Update, and the Thomas Index™. 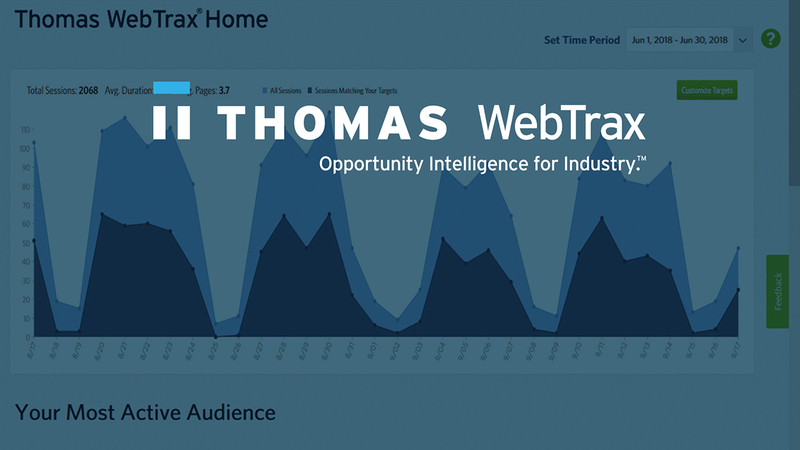 Thomas WebTrax® 3.0 delivers Opportunity Intelligence for industry: Go beyond simple web analytics and start engaging real buyers.